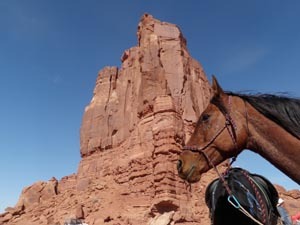 It must rank as one of the most spectacular rides on the planet: the 3-day Moab Canyons endurance ride. 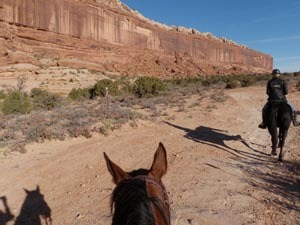 If you haven't ridden Moab yet, you may have missed your chance. Ride manager Sherri Griffith is threatening to quit putting it on, though everybody who attended tried hard to change her mind. I was a last minute substitute jockey: sadly, John could not go, so Steph stuffed me in the trailer, along with Batman and Jose and The Raven, and off we went in Betty, Betty White, the truck that flies without wings, mostly under the speed limit! Moab is first noted as being 'settled' in the 1880's by ranchers and Mormons, though the Navajo and Ute Indians were the earliest residents. Hollywood discovered the spectacular scenery in 1939. John Wayne filmed here, as did Thelma and Louise. Indiana Jones and the Temple of Doom, Geronimo, City Slickers II, Mission Impossible II, and 127 Hours, are among many of the other movies that were filmed here. The Lone Ranger, with Armie Hammer and Johnny Depp, was one of the latest. In the 1950's, uranium mining was the main boon in the area, and it was in the 1970's that tourism began taking over the economy. Now you can hike, bike, raft, skydive, hot-air balloon ride, and horse ride. 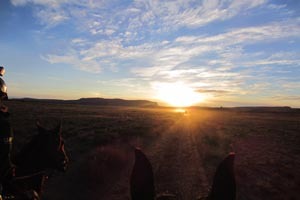 Better yet: endurance ride. 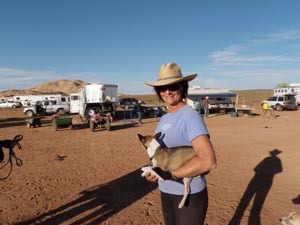 We arrived on Tuesday night, ahead of the Thursday-Friday-Saturday October 24-26 ride. 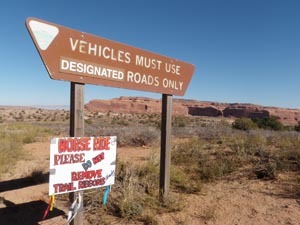 Steph and I gawked and gaped on the drive into the 4500-foot Ridecamp, 12 miles or so northwest of Moab, off of highway 313, at an old cow camp just about smack in the middle between Arches National Park, Canyonlands National Park, and Dead Horse Point State Park. We were surrounded by pink sandstone hills, red sandstone mesas, and deep gray sandstone canyons, all of which we'd be riding through. Batman and Jose both gazed and goggled at the beautiful scenery. It's total Outlaw country. The canyons and mesas and spires and eroded hills form slot canyons and box canyons, hidden oases and dry gulches. Barely visible trails over the polished slickrock lead up and out of canyons and twist down into the next ones. Day 1: 55 miles. Loop 1 wound around the reddest, most formidable sandstone mesas and spires and cliffs formed some 275 million years ago, give or take a few bazillion. The piercing red hues in the October morning golden light were mind-blowing. 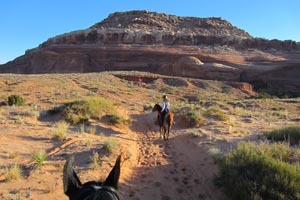 We rode around the very base of one of these 7-mile-long imposing mesas and Termination Towers dwarfing us by some 900 feet, through red and pink sand, over gray sandstone slickrock. 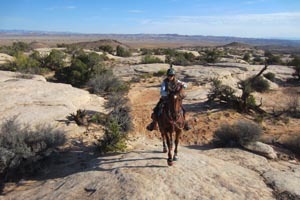 The term 'Slickrock' derived from early settlers, whose horses' shoes slipped on the sloping surfaces. We could see white slip marks from shod horses who trod before us, but with our Easyboot glue-ons and gloves, Batman and Jose skipped over the sandpaper-like surfaces. 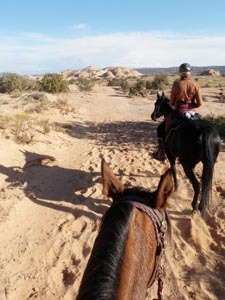 We wound through canyons with weathered hills that Steph described as dumplings, and some as twisted taffy. Loop 2: We dodged Hell Roaring Canyon, traversed Deadman Point, to roam the sandstone labyrinths above Spring Canyon: outlaw country. Butch Cassidy. Kid Curry. Flat Nose George Curry. Bill McCarty. The Wild Bunch. The Blue Mountain Gang. Robbers Roost outlaws. They roamed this area, robbing, chasing, being chased, hiding. We could smell 'em. Jose could see their ghosts. Batman was looking for victims to rescue. 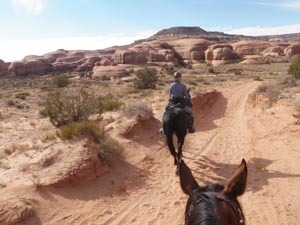 We rode over more slickrock through torturous juniper-riddled canyons, with possible phantoms behind every boulder, around every hidden twist in the wet and dry creeks, up every little blind canyon. Did this one have a secret exit? Or not? You can't help but imagine you're one of those outlaws, slipping into a slot canyon to escape detection. 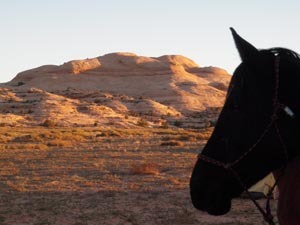 Or maybe you're searching for an outlaw who could blend in so well with the landscape that your only hint would be the sound of galloping hooves over the rocks, though the direction would be suspect with the way the sound echoes through the rocks. 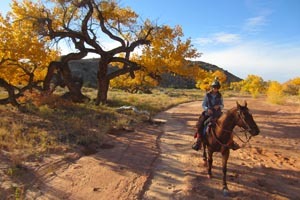 adorned with brilliant golden-leaved cottonwoods, and into more surprise, twisting canyons. 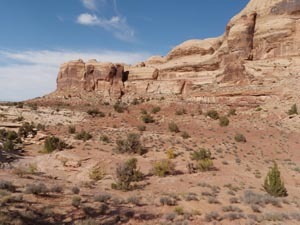 We climbed up onto slickrock sandstone flats above one of the deep, dumpling-riddled canyons, following a faint trail worn over the decades by hoof prints and, in later days, by rather daring and crazy jeep drivers. 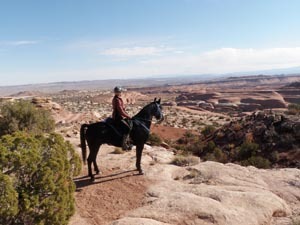 We dismounted to lead our horses up a short but steep climb with a fantastic view of this other-world of the Utah canyonlands. 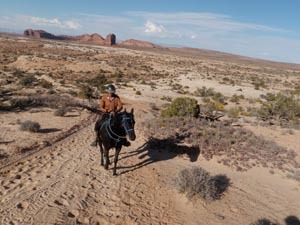 The mesa we'd topped went on and on for miles, the other end of which ended in a series of thousand-foot red cliffs known as The Needles where we looked down on the trail in the enormous valley (and riders, tiny dots!) where we'd thread on loop 2. A vet check (with catered gourmet sandwiches!) beneath some of these Needle spires made it tempting just to stay here and rubberneck at the scenery for the rest of the day. 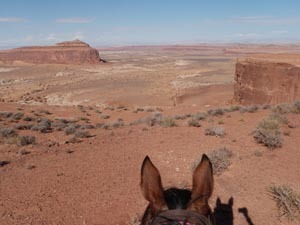 But the scenery of loop 2 beckoned: a loop through this valley below the red cliffs we'd gazed down from. Our sandstone trail took us along one of the ledges of these maroon mesas, close enough to touch the cliffs while looking off the shelf to the sand gullies below that were formed from the eons of weathered sandstone. 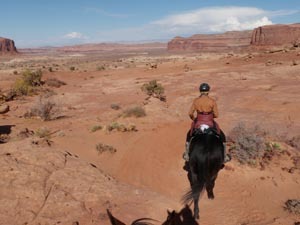 Circumnavigating Lost World Butte, we viewed the deep crimson butte and the layered valley from every angle and color, much of it through sand, much of that deep sand that the horses worked hard marching through, mile after mile after mile. More outlaw country led us zigzagging back to camp, Batman and Jose knowing exactly which turns to take, despite not having been over the trails before. We had to leave after day 2, therefore missing the last spectacular day of trails, but then, my over-stretched jaw muscles and popped eye sockets needed a rest from the overwhelming scenery. 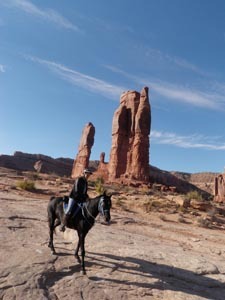 Moab is the most spectacular endurance ride I've ever done: challenging trails, splendid scenery, great horses, and marvelous company. Thank you Steph and Jose!!!!! The weather was perfect: just above freezing in the mornings, and in the 60's during the day. It didn't rain or snow; it wasn't too cloudy or too windy. 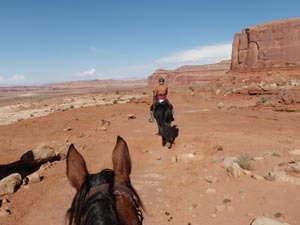 There were a few places in those air-less secret canyons where it got warm for already-hairy horses, but once you re-gained the flats, cool breezes helped cool us down. Over a dozen juniors participated in the ride, as well as over a dozen first-time endurance riders. Attendance was nearly half of a regular good year. 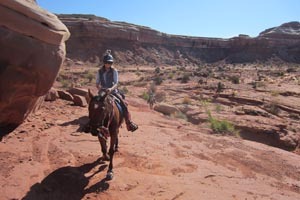 If it was not the last Moab ride, thank your lucky stars and consider this one of your Bucket List Rides that still exists, and condition your horses and your jaw muscles, and get yourself hence to Utah in October next year. You won't be sorry. Photos of me by Steph!